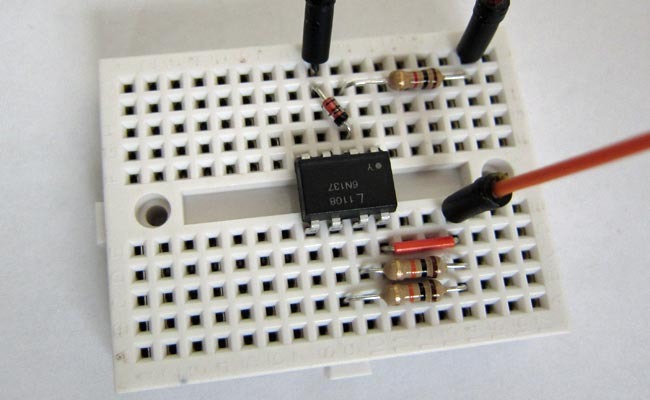 Digi-Key is a great place to purchase the optoisolator, diode and resistors. 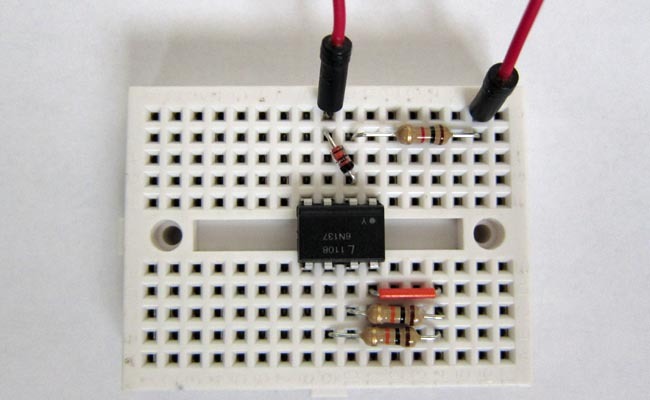 Step 1 Place the optoisolator on the breadboard. Pin 1 has a little dot above it. 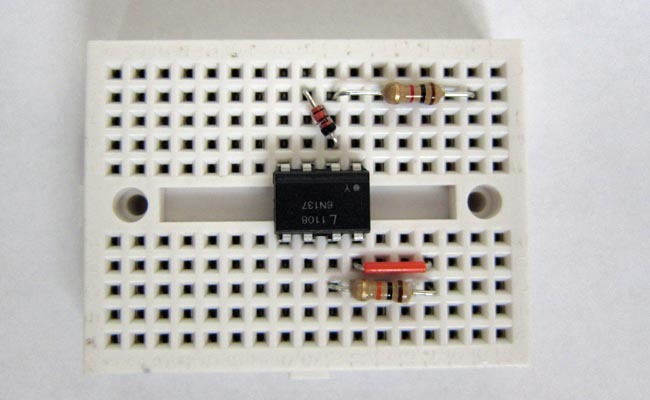 Step 2 Place the diode between pins 2+3 on the optoisolator. 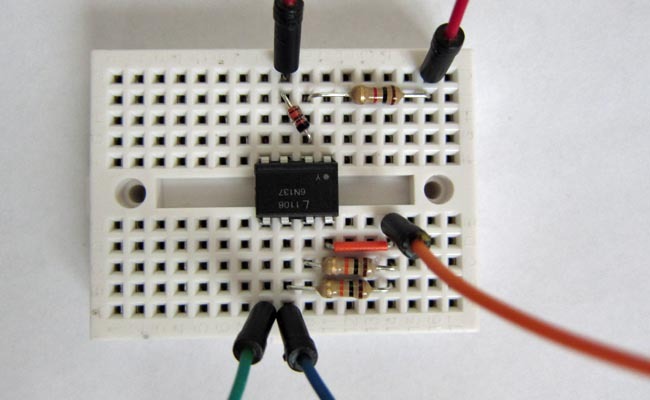 The orientation of a diode matters. Make sure you have it facing the right direction. 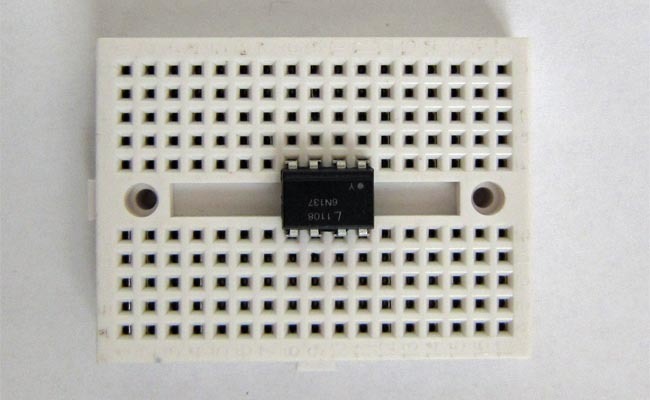 Step 3 Place the 1K resistor from pin 2 to an unused slot. Step 4 Insert a small jumper from pin 8 to an unused slot. This slot we'll refer to a +5v. 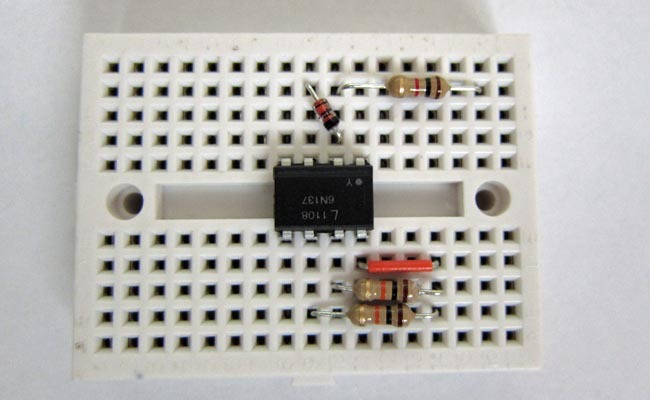 Step 5 Place a 10K resistor between pin 7 and +5v slot from step 4. 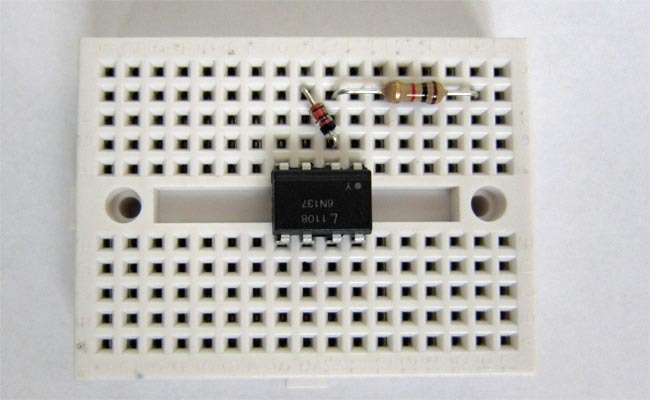 Step 6 Place the other 10K resistor between pin 6 and +5v slot. Step 7 Place jumpers (we used red) to attach to the input signal. One on pin 3 and the other to the unused slot from step 3. These are the connection to DCC signal, or simply the rails. 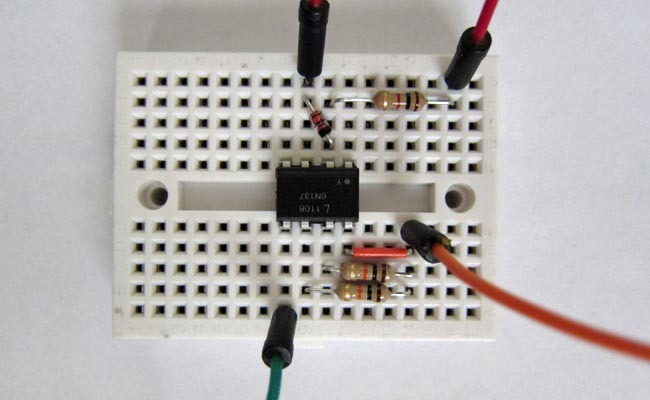 Step 8 Attach a jumper (we used orange) to attach to +5v on the Arduino. Step 9 Attach a jumper (we used green) to pin 5. 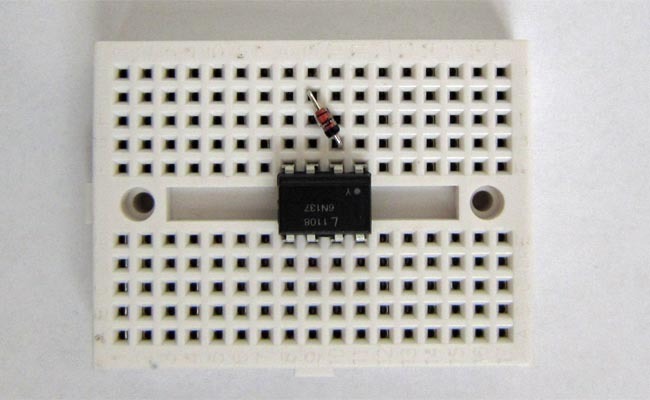 This will attach to gnd on the Arduino. Step 10 Attach a jumper (we used blue) to pin 6. 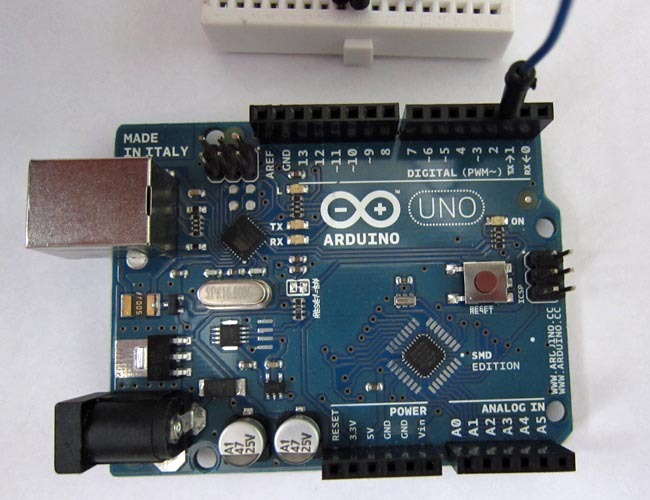 This will attach to interrupt on Arduino. 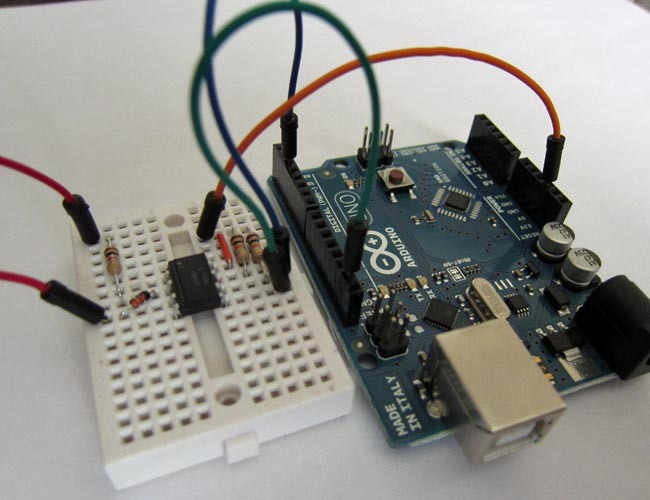 Step 11 Attach interrupt jumper (blue) to pin 2 on the Arduino. 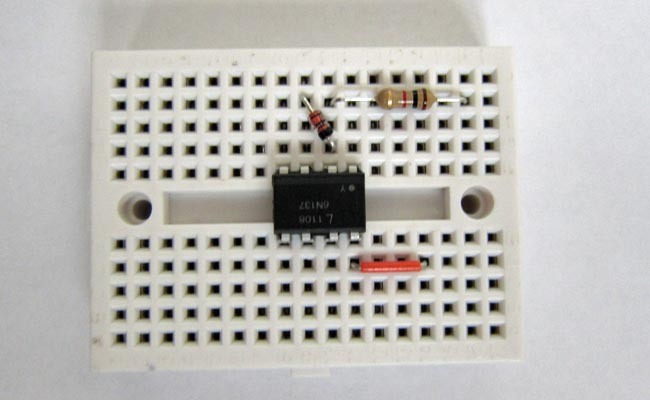 Step 12 Attach +5v jumper (orange) to 5v on Arduino. 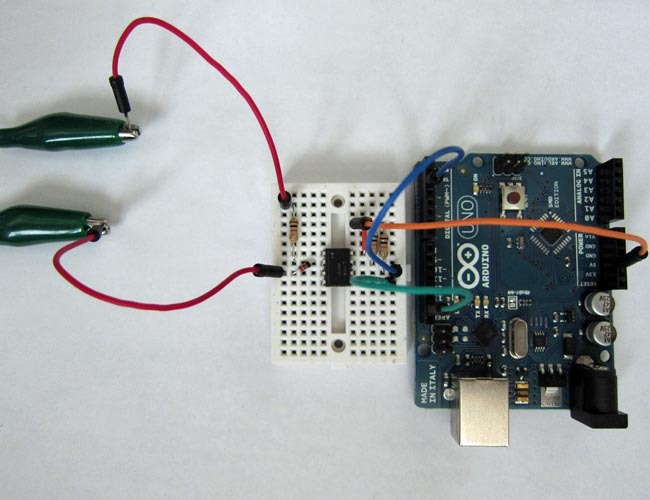 Step 13 Attach gnd jumper (green) to GND on Arduino. Step 14 Attach jumper wires to the rails where a DCC signal will be present. The rails are not shown in photo but they're on the other end of the clip leads. We tested this with our NCE system. Step 15 Download and install our DCC_Decoder library. 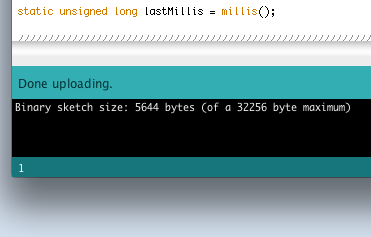 The download is in a zip file. In general, you'll unzip this to get the DCC_Decoder directory. Copy this directory to the libraries directory inside the sketchbook location. The libraries directory may not exist and you'll need to create one. 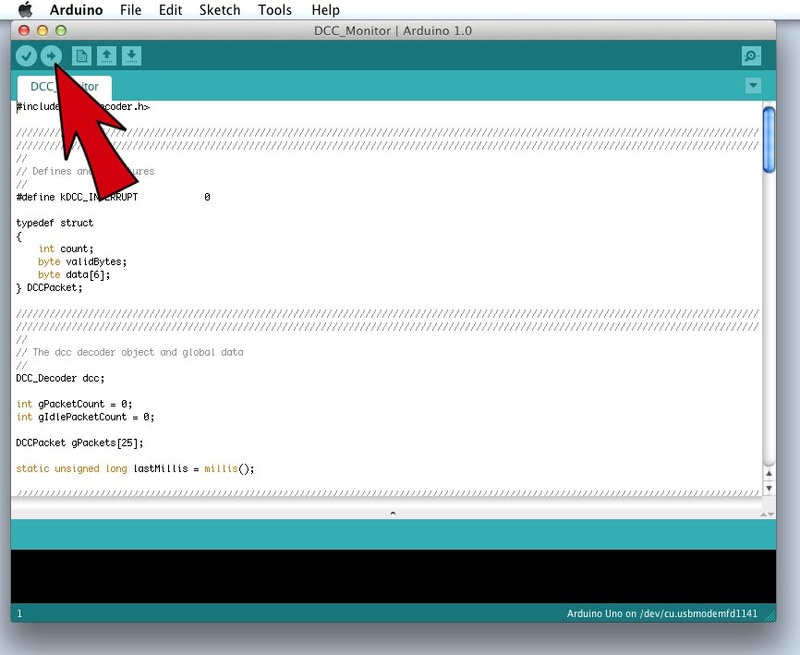 See the preferences in the Arduino IDE for the sketchbook directory location. Place the DCC_Decoder directory (not .zip file, it's unzipped contents) inside the directory named libraries. 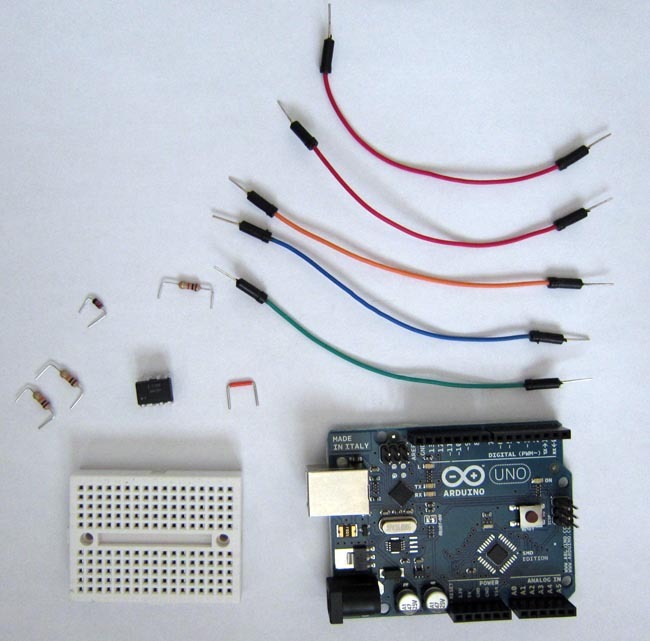 Step 16 Attach the Arduino to your platform with the USB cable. No photo, but a simple step. 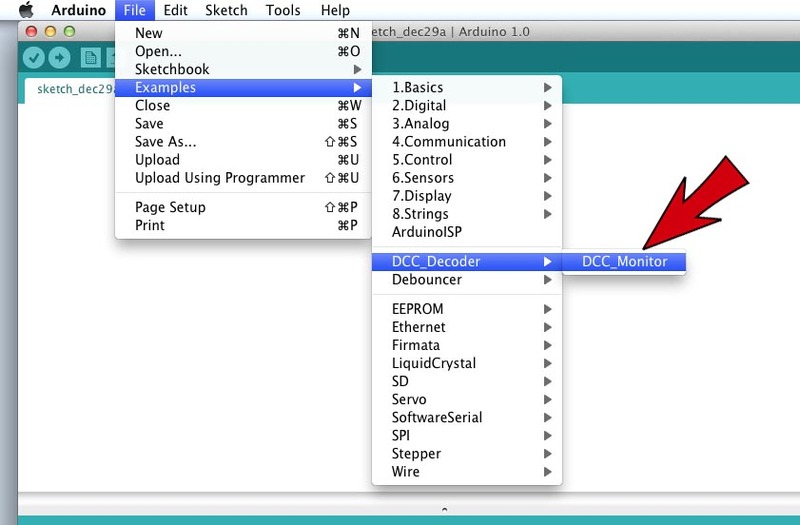 Step 17 Launch Arduino IDE and choose the DCC_Monitor example. 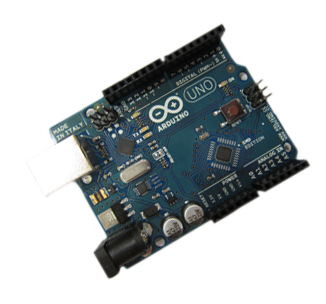 If DCC_Decoder isn't there you might need to restart Arduino IDE or the library isn't installed correctly. Go back to step 15. Step 18 Upload the sketch to your Adruino. Step 19 Wait for upload to finish. 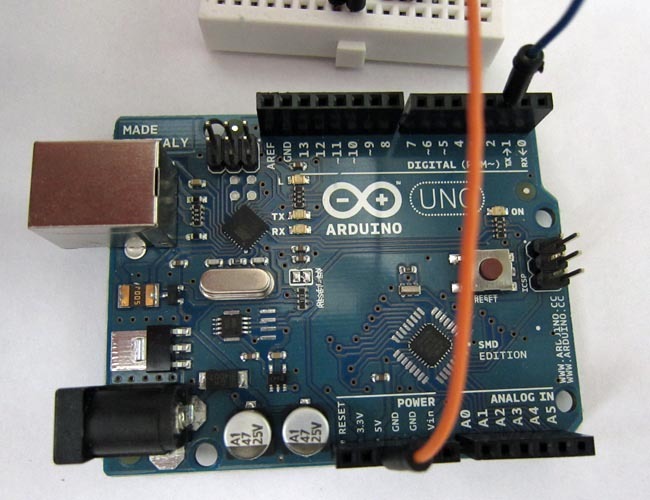 Step 20 Open the Serial Monitor in the Arduino IDE. 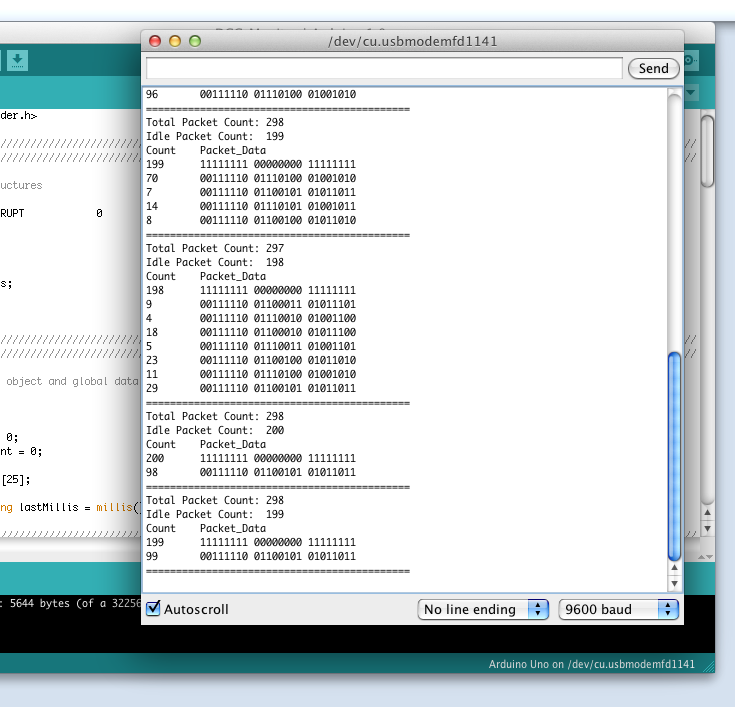 Step 21 Turn on the DCC booster and watch packet data in monitor window.